Marsha P. Johnson was an African-American transgender woman who was a well-known activist for LGBTQ rights. Marsha P. Johnson was an African-American transgender woman who was a well-known activist for LGBTQ rights. She was known as a key figure in the Stonewall uprising that happened in 1969. She was also an iconic drag performer. 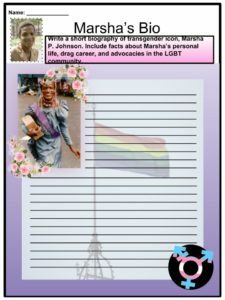 See the fact file below for more information on the Marsha P. Johnson or alternatively, you can download our 21-page Marsha P. Johnson worksheet pack to utilise within the classroom or home environment. 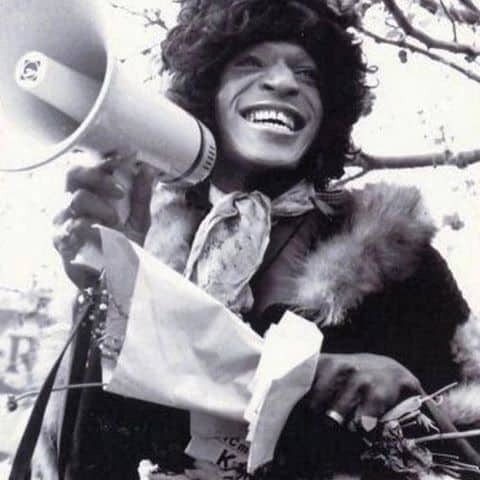 Marsha P. Johnson was born in Elizabeth, New Jersey on August 24, 1945. 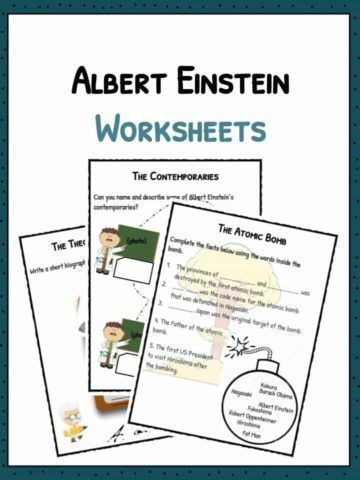 Her birth name was Malcolm Michaels Jr.
She was born to Malcolm Michaels Sr. who worked for General Motors as an assembly line worker, and Alberta Claiborne who was a domestic housekeeper. 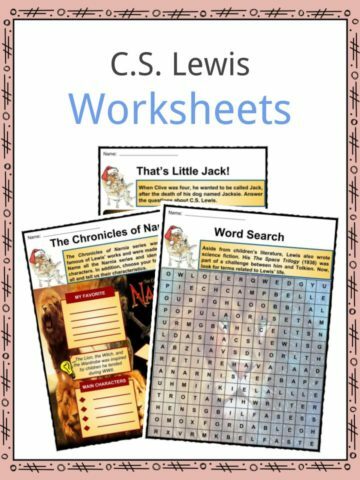 She grew up as a Christian attending the African Methodist Episcopal Church. At five years old, she started playing around and dressing up in girls’ clothes. Boys in her neighborhood would make fun of her so she stopped wearing dresses. 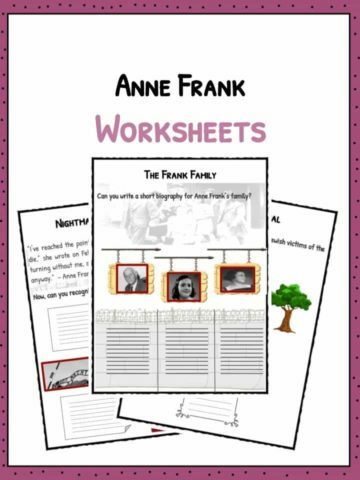 Her parents, particularly her mother, were unsupportive of homosexuality. In 1963, she graduated from Edison High School, which is now named Thomas A. Edison Career and Technical Academy. After graduation, she moved to Greenwich Village, New York City in 1966 and became a prostitute and a drag performer. Her first drag queen name was Black Marsha. 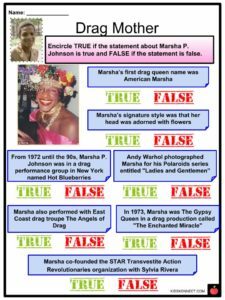 She changed her drag queen name to Marsha P. Johnson which was derived from the restaurant Howard Johnson’s. 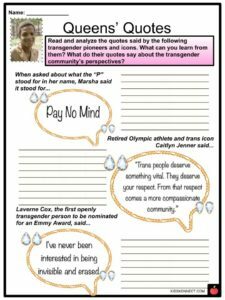 The “P” in Marsha P. Johnson stood for “Pay it no mind.” which is her answer to questions about her gender. Since Marsha could not afford expensive clothing, Marsha’s style of drag wasn’t considered serious drag. She was known for adorning her head with flowers. Beginning 1972 until the 90s, Marsha P. Johnson was in a drag performance group in New York named Hot Peaches. Hot Peaches was J. Camicias’ international drag troupe. Marsha also performed with East Coast drag troupe The Angels of Light. In 1973, a drag production called “The Enchanted Miracle” was performed in by Marsha whose role was The Gypsy Queen. In 1990, Marsha joined The Hot Peaches in a London performance. Also in 1990, Marsha made an appearance in “The Heat” which is another production by The Hot Peaches. The Stonewall Inn is a gay bar in Greenwich Village, New York. The Stonewall uprising, also known as the Stonewall riots or Stonewall rebellion, happened on June 28, 1969. In the early morning of June 28, police raided the inn and the LGBT community responded with a series of riots. The uprising lasted nearly a week. 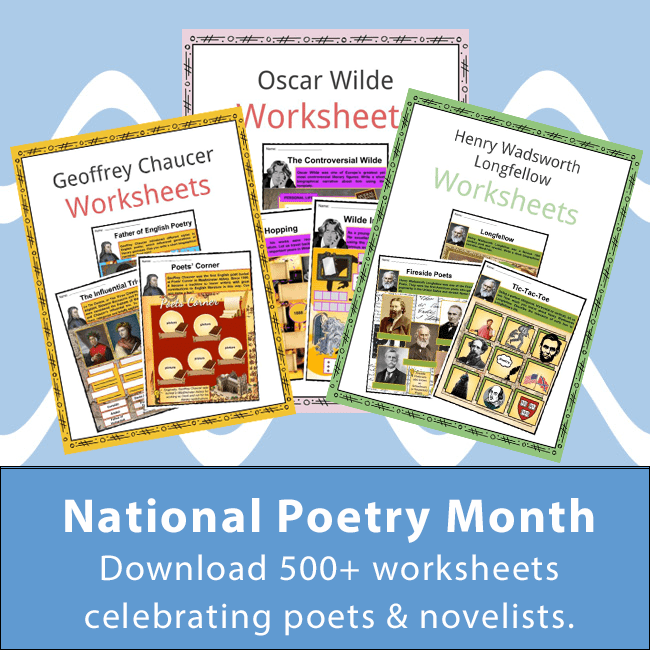 The 1960s was a controversial time for socio political activism: the gay liberation movement, civil rights movement, and anti-Vietnam war movement were at its peak. The Stonewall riots united the residential community of Greenwich Village into activist groups. The aim of those activist groups was to fight for inclusivity in establishments, especially for gays and lesbians. 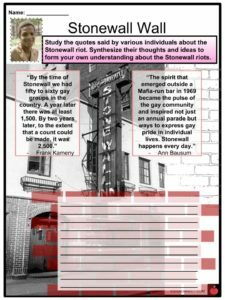 The Stonewall uprising is considered a pioneering event leading to the gay liberation movement. After the Stonewall uprising, two gay activist organizations and three pro-LGBT newspapers were established in New York within six months. Marsha joined the Gay Liberation Front. The Stonewall National Monument was put up in 2016. The first gay pride marches happened on the first anniversary of the Stonewall uprising – June 28, 1970. The first gay pride marches occurred in New York, Chicago, San Francisco, and Los Angeles. In New York, Marsha participated in the first Christopher Street Liberation Pride. Marsha Johnson and Sylvia Rivera co-founded the Street Transvestite Action Revolutionaries (STAR) organization. The two of them were active at gay liberation marches. Johnson and Rivera were banned from taking part in gay pride marches by the organizing committees because they were drag queens and drag performers were then deemed as giving the marches a bad reputation. In 1972, Johnson and River put up the STAR House which is a shelter for homeless LGBT people. Marsha Johnson was known as the “drag mother” in STAR House. In the 1980s, Johnson became a respected organizer with ACT UP. During Marsha’s time, the term ‘transgender’ was not widely used, so Marsha would refer to herself as gay or transvestite. She also referred to herself as queen, from her performance work in drag. 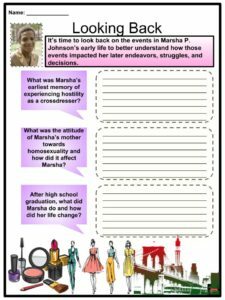 Marsha suffered severe mental illness. She was also arrested by the police many times. Marsha’s body was discovered floating in the Hudson River a few weeks after the 1992 pride parade. Her death was first ruled as suicide but her friends (including Sylvia Rivera) insisted that Marsha was not suicidal. Marsha was cremated and her ashes were carried to the Hudson River. Transgender activist and crime victim advocate Mariah Lopez got Johnson’s case reopened as a possible homicide in 2012. In 2015, The Marsha P. Johnson Institute was established to advocate for the protection of the human rights of black LGBT people. This is a fantastic bundle which includes everything you need to know about Marsha P. Johnson across 21 in-depth pages. 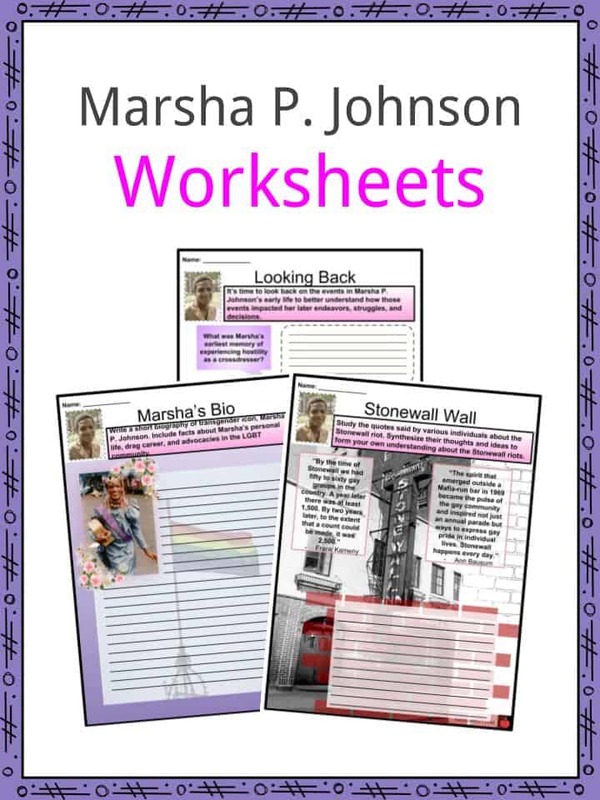 These are ready-to-use Marsha P. Johnson worksheets that are perfect for teaching students about Marsha P. Johnson who was an African-American transgender woman who was a well-known activist for LGBTQ rights. She was known as a key figure in the Stonewall uprising that happened in 1969. She was also an iconic drag performer.